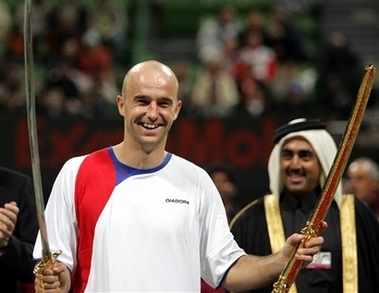 DOHA, Jan. 6 (Xinhua) -- Ivan Ljubicic of Croatia beat Andy Murray of Britain 6-4 and 6-4 to take home the trophy from the one million U.S. dollars Qatar Open tennis tournament on Saturday. 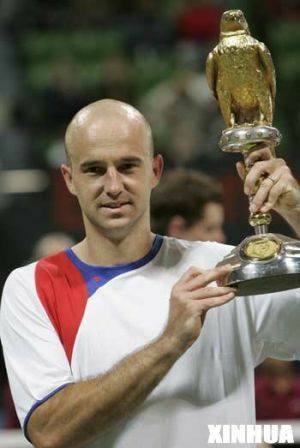 World number five Ljubicic, who won three titles in 2006, resorted to his big serve and backhands to wear out the British number one in the final. "It's a great feeling to come back and win here after being runner-up in 2004 and 2005," said the 27-year-old Croat, "It's a great feeling to be number one in the ATP Champions Race...although it may be for a short period." Murray, 19, troubled his opponent with his double-handed backhand and top-spin forehand but Ljubicic wriggled out of several tight spots, led 5-4 and broke serve in the 10th game to clinch the first set. In the second, Murray broke Ljubicic in the fifth game to go 3-2 up. The Scot was 0-40 down in the sixth game and, though he saved two break points, Ljubicic broke back to make it 3-3, then broke again in the 10th game to wrap up the match. "Murray is a tough opponent. I had to be aggressive but not too aggressive," Ljubicic said. "I had to have a mix of baseline and net play. I just waited for the points because he doesn't make too many mistakes." Murray was playing in the fourth final of his career. He has one title to his credit at San Jose last year. "Ivan is a great player and a great fighter and I lost to a better player today," Murray said.